Mayor Blasio says he is going to get rid of carriage horses in New York City, specifically singling out the horse-drawn carriages in Central Park. He plans to replace them with vintage electric cars. Journalist Sarah Ferguson recently wrote a Facebook post on this move by de Blasio. Her piece made me realize the extent to which we have isolated ourselves from the animal kingdom, and also how rules and regulations are destroying the quality of life in New York City. I’m not here to present myself as an expert on horses. But I do know a little about the subject, and the Facebook post got me remembering my past connection to horses. My western Canadian grandparents on both sides were pioneers. My parents also grew up as pioneers. 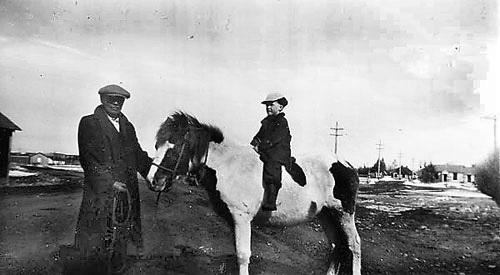 In the late 1940s, my father and a Native American friend, in a covered wagon pulled by a team of horses, and bringing along a herd of horses with them, made the several-hundred-mile trek from Saskatchewan to Alberta. In Alberta, my father worked out a deal with a couple of Indian reservations to keep his horses on the reserve. One year the tribe would get two out of three the newborn folds, the next year my father got three and the tribe two, and so on. It got to the point where the herd ended up being a couple hundred horses. The nature of the reservation was such that the horses could run free. My father was a very eccentric person and — who knows why? — but he felt deeply connected to the idea of wild horses. Some of the horses were broke to ride, some were sold, but for the most part, it was about the wild herd. We also lived in the city, and in our working-class community, my father raised pigeons, guinea pigs, sometimes a rooster, and at times had a horse in the backyard. Our backyard was a little like one of those Lower East Side Puerto Rican plots. But instead of a casita we had a pigeon coop. With all my father’s eccentricities, it would be an understatement, to say he was out of sync with the rest of the community. He lived by his own rules. As a child I spent many summer days playing on the different reservations. To put this into some kind of perspective, Saskatchewan and Alberta became a province in 1905. In what became Alberta, the Blackfoot tribe signed a treaty with the British in 1877. I was born in 1948. As a child growing up, I especially remember a couple of the elders, the Big Plumes and Alex Bull, and was especially close to a young Calf Robe. In one memory, I must have been around 5 years old, sitting on the grandfatherly Alex Bull’s knee, in a small wooden house filled with the smell of burning wood. His breath had the sweet smell of dried wild berries he had been eating. The elders were still directly connected to the aboriginal days. What especially affected me were the nightly drum circles the tribes held at the Calgary Stampede Indian Village. The pounding drums, the eldersʼ singing — then mix in Alex’s breath and the smell of wood burning — it all combined to charge my wild adolescent imagination, filling my body with a spiritual experience. I felt like I was going back all the way to ancient times — and for those moments, for me, it was. My worst experience with horses happened when I was in junior high school. I used to ride a horse in the Stampede Parade. On one particular day, four of us — two older guys, a girl a little older than me, and myself — were on the way to the parade, and came across an obstacle with two choices. The obstacle was a ravine with a steep, grassy slope that ended at a busy road. The road then rose up another steep hill. Or we could just ride across the railway trestle. There was one issue with the trestle, though. On the other side was a hill that the track curved around, so one could not see a train coming. But it was a three-minute ride at most. What was the chance of a train coming? The horses were a little spooked by the tracks, so we let the first two older riders go first. Then the girl went, and I came up last. All of a sudden, a day liner came speeding around the hill. The first two made it across the span. I hopped off my horse and pulled it by the reins back to where we had gotten on the trestle, then turned around just in time to see the girl fighting her frightened horse. She was pulling hard on the reins, then — smack, the train hit the horse. She flew up in the air and then down about 60 feet to the ground below. Her horse ended up close to where I was standing next to the trestle. It was the first time I witnessed a violent death. It is a sight I will never forget. Needless to say, we were the news story of the day — and continued to be headline news because the girl survived. She was in a comma for 91 days and had to learn to walk and talk again. I have lived in New York City long enough to be somewhat separated from the natural environment, but not long enough to think of horses as show animals only to be looked at in zoos. Horses are work animals. Hauling a carriage is what carriage horses have been bred to do. There have been horses pulling carriages on city streets as long as there have been streets. My friend, R.I.P., Lionel Ziprin, as a child growing up on the Lower East Side, remembered seeing horses freezing to death on the winter streets. It is not the horses’ work that is the problem; it is the horses’ care that needs to be dealt with. Why aren’t people pushing to get rid of the police horses? The police horses deal with much more crowded and noisy streets, drunks, protests, cherry bombs, riots. They’re out in the hot sun and rain, sometimes hours without breaks. This is no walk through the park. The difference is the police horses are well cared for. This is the kind of care the carriage horses need — not to be put out to pasture, whatever that means. We do not need to lose another part of New York City. What do we get in exchange? More cars in Central Park? More bike lanes? More Starbucks? More sterility? What about the drivers’ jobs? Let’s save the horses, one of the longest, ongoing, continuous connections that we the “common” people have to New York City past and present. Olga Humphrey: The horses do get great care: 4 vet visits a year, box stalls to lie down in, regulations from many agencies, months of vacation in the country. The pro-ban people are trotting out pictures of horses in third-world countries and basically lying. They are the unwitting pawns of the real estate guys who are really behind this. Cindy: Thanks for supporting the carriage horse trade. I too grew up with horses - work horse, show horses, sleigh horse - and found that most like to work. One correction: by all appearances these horses are well cared for and the owners heavily regulated. Why not pay the stables in Hells Kitchen a visit? I think you'll be most pleasantly surprised! BBMW: For those who care about the horses, what do you think will happen to them once they're no longer needed to pull tourists around Central Park? They'll end up on dinner plates in Europe. matt: More nonsense from our all-nonsense mayor. the barn rules: Thank you so much for your support - the horses are indeed well-cared for - they are some of the most regulated animals in this country. The sad fact is this: - this push to ban the NYC carriage horses has nothing to do with the horses and everything to do with a real estate developer that wants the land the carriage stable occupy. You can read more about it here: http://www.savenychorsecarriages.com/ Guest: If you cannot see that there are valid arguments on both sides, then you're just a partisan. But to find a middle ground will take compromise on both sides. For example, how about creating a new set of paths through the Park that are only for horses? Ban horses from the streets around the park as well as the streets within the park, so that horses are not tortured by cars, cyclists, and other machines. Put the stables inside the Park and let the developer do as he pleases with the property outside of the Park. Stop all horse hails on the Park perimeter and require reservations for Park rides. Regulate carriage rides just like horseback riding. Contrary to this article, the world and the City has changed a lot since the wild west, and we can't keep treating horses in the City as if industrial life hasn't grown up around them. Adjustments must be made, and if the carriage lobby isn't ready to scale back, the mayor will quite likely remove them altogether. All sides need to get smarter in the 21st century. Jerry: That was a very well written piece.